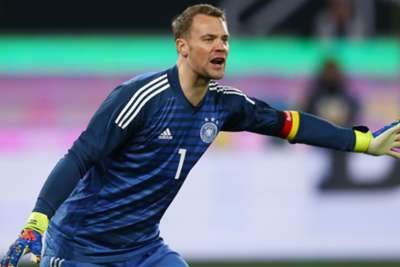 Joachim Low has hinted Manuel Neuer will remain his first-choice goalkeeper at the start of Germany's Euro 2020 qualification campaign ahead of Marc-Andre ter Stegen. Neuer started against Serbia in Wednesday's 1-1 friendly draw, suggesting the Bayern Munich goalkeeper is still in front of his rival for the role. Barcelona's Ter Stegen replaced Neuer at half-time but had very little to do, Germany improving in the second half as they fought back to avoid defeat on home soil. Germany's qualifying campaign begins on Sunday with a trip to face Netherlands, and Neuer looks set to keep his place in Low's XI. Only a draw, but plenty of positives. "You can assume that," Low told reporters when asked if Neuer's selection on Wednesday was an indication of him also doing so on Sunday. "At the end of last week or in the past, I've already said that Marc-Andre will definitely have some chances. That's my plan. "Now we have just made one game, in this one he has played a half. That was our decision, that Manuel plays as captain in the first half. "In the second half then Marc-Andre played, but we still have some games during the year and he will certainly get his opportunity."